This dessert is so delicious, you'd never know it contains no added sugar! It's also full of good-for-you ingredients! I love cooking with my boyfriend, Lawrence. He's really creative in the kitchen. So we recently came up with the tastiest dessert idea together! By the way, check out my recipe video of this pudding! I eat a lot of bananas. I always have a bunch at the ready in the kitchen, and I often grab one when I'm running out the door. It's the perfect portable fruit, after all, since it doesn't get crushed as easily as some other options. And Lawrence loves powdered peanut butter, so we always have a supply on hand. 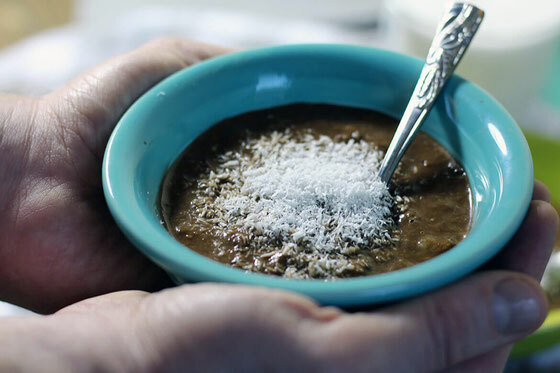 So we combined our favorite ingredients to make this vegan pudding. 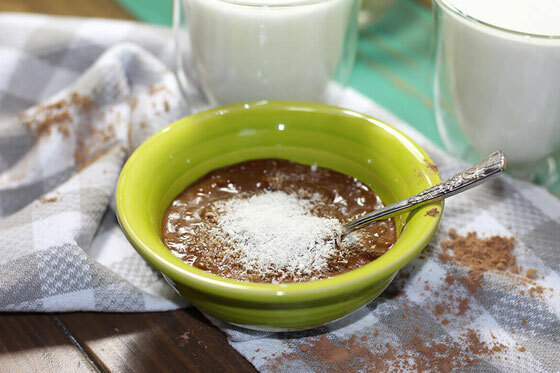 It takes just minutes to make, plus it's sweetened with unsweetened cocoa powder and has no added sugar. This dessert is a good source of filling protein and also offers blood-pressure-helping potassium from the bananas. Lawrence and I really enjoy the pudding alongside steamed milk (you can steam any type of milk or milk alternative). I hope you enjoy it as much as we do! In a mixing bowl, use a potato masher to mash bananas. Mix in powdered peanut butter and cocoa powder, then stir with water. Add more water, if needed. Top with coconut. Serves 2. What are your thoughts on this topic? What are your favorite vegan desserts?